We have been getting many questions from dog owners about the spots that are formed from dog urine and poop. Questions such as… why is my lawn dying in areas? or how best do I treat or prevent these spots? In this blog article, we attempt to answer these questions and provide some good suggestions to prevent them from happening in the future. Why is my lawn getting spotted from my dog’s urine and poop? Unlike common thought, it is the high concentration of nitrogen and associated salts in both dog urine and feces that causes our lawns to “burn” in areas and turn brown. This is the same thing that happens when we over-apply fertilizer in an area of the lawn and it “burns” as a result. Because female dogs squat to pee, it is more common for spotting to occur because the urine is more concentrated in a targeted area, but there is nothing chemically different with female dogs. How do I best treat or prevent spots in my lawn? There are some products on the market that will revive your lawn and recover brown spots. We have sold these for a number of years now (See Spot Run and Revive are the two dog spot treatments that we have this year) and they are effective for most customers. The concept here is that the urine is broken down by the microorganisms that are in the product and the nitrogen and salts are rinsed through the soil as a result. Many of the same benefits can be achieved by simply watering the areas that your dog likes to pee. Frequent watering or rainfall will dilute the urine and rinse the salt and nitrogen through the soil before they cause damage to the turf grass. Some homeowners choose to have a watering can near by and will rinse the areas immediately after their dogs does his/her business. Products such as gypsum (that loosen and breakdown deposits in the soil) and limestone (that help neutralize soil) have been long recommended for helping the lawns of pet owners, but these products have never been scientifically proven to remedy dog spots in particular. If my grass is brown, is it completely dead? Not necessarily. 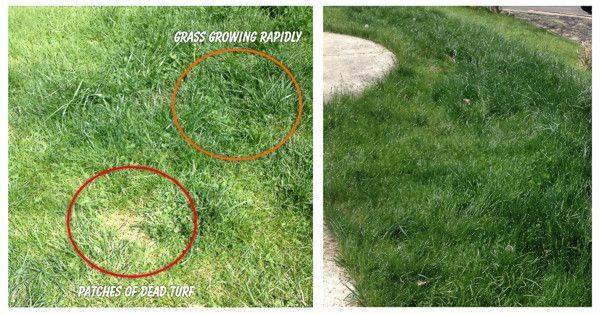 Dog spots first turn brown when plant tissue is burnt, but if left untreated the deposits of nitrogen and associated salts will completely kill the grass. We would recommend that you first try some of the remedies above, but if you do not see visual improvements within a couple of weeks, then you will have to reseed those areas. To do so, you will need to remove the dead grass as well as about 0.5 – 1 inch of the existing soil and then fill those spots in with high quality top soil and grass seed. What if my grass appears to be healthier and growing faster in areas that my dog pees? It is very common to see areas of rapid growth where your dog pees, because the nitrogen acts as a fertilizer for your lawn. The problem is that too much nitrogen will start to have adverse effects! 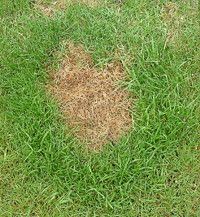 What you will often find is that brown “dead” spots are surrounded by areas of rapid growth. The center suffered from too high a nitrogen level, but the periphery is doing just fine because the nitrogen and salts are in good balance still. A couple of final notes… it is best to make sure that your dog is always hydrated. Make sure to keep water easily accessible during the day. Also, you might want to consider training your dog to use a specific area of the lawn that will not be so much of an eye sore if damage were to occur. To do so, you may want to take your dog out on a leash when peeing and/or set up a fenced in area that is an obvious visual to your dog.